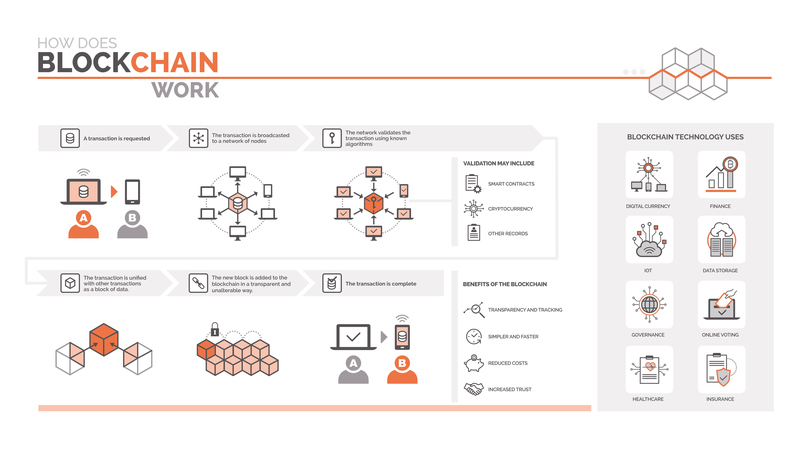 Blockchain could provide collision repairers, insurers and consumers a secure, decentralized means of creating, accessing and updating a vehicle’s life story. As the car progresses through life, every oil change, tune up or parts swap is logged and attached to the file. After a crash or hailstorm leads to a vehicle ending up in a body shop, the repairer adds further blocks containing the estimate, scan report, and which aftermarket, new, used or reconditioned parts were added. A year later, the OEM announces a recall and adds that to the chain. The owner takes it to a dealership, who completes that recall and shares that detail with the chain. The owner sells the car two years later to a buyer, who prior to cutting the check is granted permission to access the blockchain and view some data like the entire history of maintenance but not the blocks pertaining to seller personal information. The prior owner’s access to the chain ends, and the new owner starts a new vehicle life history also added to the chain. Eventually, that owner wrecks the car, it’s deemed a total loss — something also added to the chain — and sold for scrap. The recycler now can disassemble the car confident in which parts are OEM, which are aftermarket, and which were used — as well as if any of the parts remain under recall. The data is stored on and remains accessible to all the authorized parties on the chain, even if one of them goes out of business or wishes it could take it back. This isn’t one of our runs down the hypothetical rabbit hole. It’s a variant on what Mitchell pitched during January’s Collision Industry Conference Week and what two Accenture experts described last year during TU-Automotive’s 2017 Connected Car Insurance USA conference. Even salvage yards are thinking about blockchain. We asked Michael Wilson of the Automotive Recyclers Association if his organization had considered the technology, as it seemed to be a solution to recycler concerns over unwittingly receiving recalled parts. The organization sent back an in-depth response we’ve chosen to publish as a guest column here. 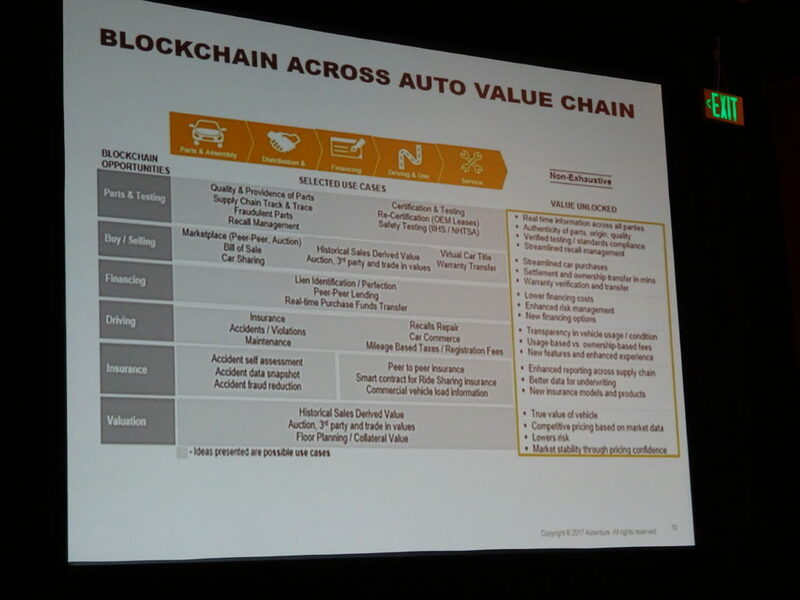 Greg Riche, senior manager of Accenture Mobility, said at the Connected Car Insurance conference that Toyota and MIT were working on a blockchain system for driverless car data sharing by parties like consumers and insurers. Bosch and TUV Rheinland were looking at blockchain to prevent odometer fraud, he said, and Accenture has talked to OEMs who were considering things like putting a car frame serial number on the blockchain. Some OEMs might argue that they’d never do such a thing, but “we all see” what was happening with proprietary systems, said Riche, who doubted OEMs could keep it locked up. “Openness is the way to go,” Riche said. Everyone benefits from information flowing on the blockchain, he said. Think about crash reconstruction, where “we all believe our data” but we think the other party is lying. With blockchain, everything is laid out on the chain, and “it’s immutable data,” Riche said. Riche also mentioned a CARFAX-like system where vehicle history could be reported in nearly real-time. Why would a customer trying to sell their car someday want data about a crash or collision repair reported to the blockchain? We can see a couple of situations that force the issue and take it out of their hands. In one scenario, the government makes everyone do it, feeling all vehicle buyers — whether consumers, dealerships, auto auctions or salvage yards — deserve to know that information. By requiring reporting to a decentralized system like blockchain, lawmakers couldn’t be accused of favoring a particular for-profit clearinghouse, such as CARFAX. The John Eagle Collision Center case, in which a couple suffered a horrific crash found to have been exacerbated by an improper repair, is a great example of why this could be required. The plaintiffs said they’d never have bought their Honda Fit if they knew it’d received hail damage repair. It’s hard when confronted by such a situation to argue such consumers don’t deserve the right to know what they’re buying. The other scenario involves the free market and self-interest taking care of the matter. Data goes on the blockchain because adding blocks is convenient, in many parties’ interest, built into everybody’s software and helps everyone in the chain do their job better. For example, a shop might report data to the blockchain to minimize their own liability — they can prove what they did and see what a previous shop did. Ultimately, the vehicle owner goes along with it and even embraces it, because if a collision is going to be revealed by third parties or the car itself, you might as well maximize resale value by proving regular maintenance records, proof OEM parts were used (particularly on a lease return), and a certified collision center did the work. Riche said a blockchain reveals the true asset value of a vehicle. Blockchain, which got its start as the method for creating and exchanging bitcoin, stays secure because of two factors, according to Mitchell and Accenture. The first is just encryption. Richard Meszaros, Accenture managing director in charge of the Internet of Things Connected Commerce practice, explained this using an example of paying a bitcoin to Riche. Under bitcoin, both Meszaros and Riche have individual public and private addresses. Their public address is like their house number, Meszaros said. Their private address is like their front door, locked with a private key and protecting the currency owned by each man. Meszaros uses his private key to send money to Riche’s public address — Riche needs his private key to access it — publishes the transaction to the network, and the software contained on the decentralized network of all other bitcoin users validates that the transaction is legitimate (for example, the money hasn’t been spent twice). “Greg gets his money,” Meszaros said. The initial bitcoin concept by “Satoshi Nakamoto” says further privacy can be created by keeping public keys anonymous. “The public can see that someone is sending an amount to someone else, but without information linking the transaction to anyone,” Nakamoto wrote. The author also mentioned that generating new public keys for every transaction was probably a good idea. Meszaros predicted that someday, nobody would need a bank account — just a blockchain. “That’s how transformative this technology truly, truly can be,” he said. 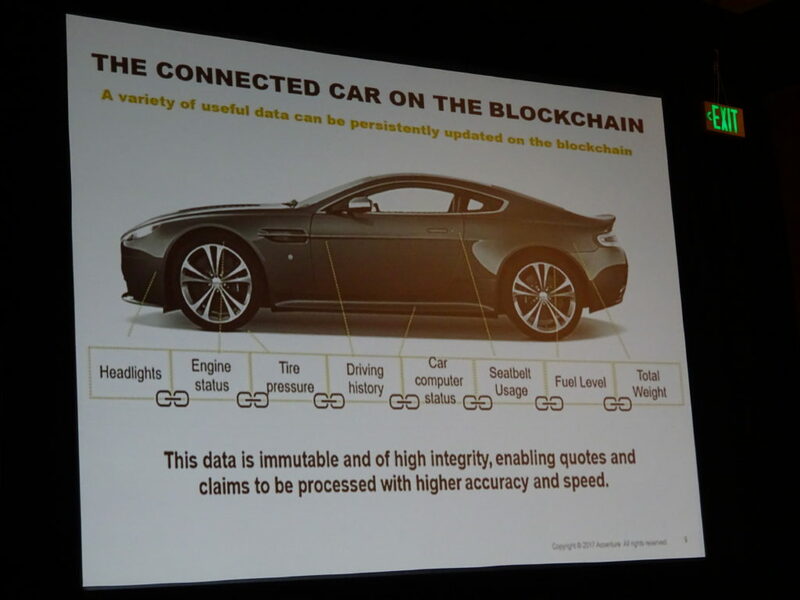 That’s kind of how it would work on an automotive blockchain like that being developed by Mitchell, though the asset here is data rather than currency, and more than a single counterparty can potentially access the data. “Everybody has that asset,” but only authorized users armed with their own private keys can actually decrypt and see it, said Abhijeet Gulati, senior engineering manager of artificial intelligence at Mitchell. Each node contributing data to the chain defines who can consume it. That way, the record can’t be lost — it’s saved everywhere — but it is impossible for all but the designated parties to read it. “It’s kind of synchronized,” he said. You could theoretically crack a bitcoin private key through “brute force” checking every possible combination of characters until you lucked into the correct key. However, as private keys are a 256-bit hash — a gibberishy mix of letters and numbers — running through all the permutations would basically take longer than the universe has existed. The second source of security stems from the sheer size of the chain. Let’s say you never took your car in for any oil changes or scheduled maintenance, but you want to add phony records saying otherwise before you sell the car. To change a single block, you’d have to change every block on the chain on not just your version but also every identical version of the chain held by everybody on the network — before another legitimate block is added to the chain by somebody else, according to Gulati and IEEE Spectrum. Once that new legitimate block is tacked onto the end of the chain, our hacker would have to start all over again, for the network considers the longest-running chain the correct one. Asked about fixing an honest error on an immutable blockchain, Maszeros said Accenture had been working on the idea of “redactable blockchain,” similar to how a bill’s legislative history shows all additions and deletions by underlined and strikethrough text. Mitchell’s system is kind of like what CCC is doing with Secure Share — users designate what data they wish to share and with whom — but it’s decentralized, stored online and accessible to anyone with permission. Rozint said a central server creates a “single point of weakness,” pointing to the Equifax breach as an example. Mitchell could go bankrupt or get hacked tomorrow, and the blockchain would endure unscathed — and the software continue to be distributed and new users added, according to Ravi Nemani, Mitchell Auto Physical Damage Solutions product delivery Senior Vice President. Mitchell’s solution is open source with its own stack on top, according to Abhijeet Gulati, senior engineering manager of artificial intelligence at Mitchell. Gulati said Mitchell also can’t decide to cut off everyone’s access to the data. 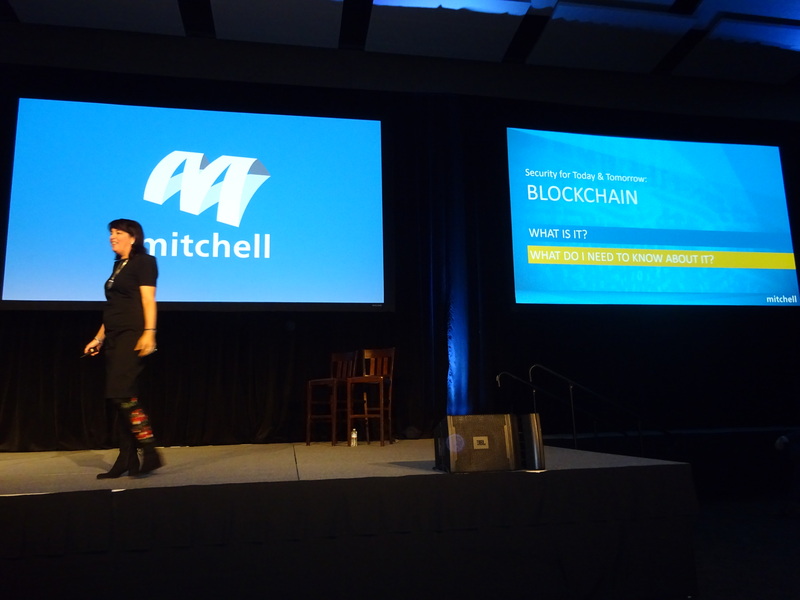 “Mitchell is committed to freedom in a secure transaction using blockchain,” Rozint said. 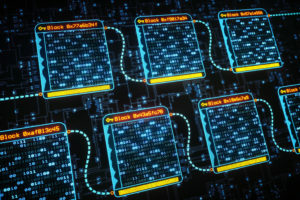 Meszaros called blockchain a “network play” and likened it to VISA, where everyone agrees to a certain set of rules and means to connect to it. CCC Vice President of market solutions Mark Fincher said CCC considered blockchain, calling it “a very secure technology” which was “probably even more secure than what we need.” He said they rejected the idea because it’s complex “on purpose,” it’s easier for repairers to have CCC manage sharing for them and blockchain was “a lot slower” due to the nature of the system. Opening a bitcoin message can take 10 minutes while the network validates the transaction, and shops wouldn’t want that kind of a wait when sending an estimate to a shop management system, according to Fincher. In Secure Share, a secure share transmission can move in about a second, he said. Nemani said there’s two ways to store data (such as a BMS XML file or a PDF of a scan report) on the blockchain. One would be to keep the data on cloud storage somewhere like on an Amazon server and put the ability to access it on the blockchain, which is what Mitchell plans. “We don’t want the size to become too big,” he said. However, one could put the actual encrypted asset on the chain, he said. This arguably would be the safest and most truly blockchainey way to do things, considering that the former technically relies on a centralized data storage authority that could go belly-up or catch on fire tomorrow. On the other hand, cloud storage providers like Google or Amazon are slowly taking over the world and will probably will be around for 20-30 years it takes before the entire U.S. fleet departs the road and there’s no more use for an individual vehicle’s blockchain. Rozint also at CIC gave a nod to the idea of a larger blockchain surrounding the car itself, describing a vehicle tracked as it leaves the dealership, receives multiple mechanical services, experiences a crash, is sold and goes up for auction. “Everybody can add a block onto this chain so that you can know that the windshield was replaced two years ago” and the correct calibration was done then, he said. As the vehicle is sold, he said, the prior owner’s rights expire, and the new owner receives certain data access privileges. The OEM itself can decide which data to share. As mentioned above, Mitchell’s blockchain is a limited-use case related to the collision claims ecosystem. But the real value seems to lie in the blockchain example Rozint, Riche and Meszaros described where the entire life story of the car is tied to the actual car — and even to its parts, once it ends up broken up by a salvage yard. Could Mitchell’s blockchain be tacked onto another blockchain, such as one launched by the OEM? Gulati said “cross-pollenation” of blockchains was possible but Mitchell didn’t have a capability to do so right now. The system was a closed network, he said. “If you want to see something on the network, you have to be part of the network,” he said. Getting on the network doesn’t require a Mitchell subscription or charge, though users would have to register with Mitchell, according to Nemani. Nemani said ideally everyone would be on the same blockchain, and it would be possible to take an anchor value and add it to another blockchain. He said the company was having conversations with other interests. For information on the 2018 Connected Car Insurance USA, email Andy Pym at andy@tu-auto.com. Correction: An earlier version of this story incorrectly characterized the Honda Fit in the John Eagle Collision case. The car had received hail damage repair at the body shop but had not to our knowledge been in an accident prior to the 2013 crash at the heart of the case. The article has since been corrected to reflect this.